An acrylic, clear drying roof patch designed for repairing cracks, seams, edges around skylights, vents, and metal joints. Dries clear. Clean Roof - Remove dust, dirt, debris, mildew and other contaminants from surface. Applying Roof Patch - Apply Roof Patch with a trowel or putty knife. 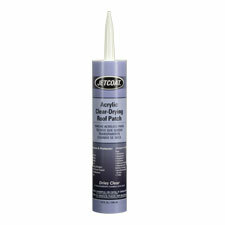 Designed for repairing cracks, seams, edges around skylights, vents, and metal joints. 61771 .9 gal. Can 9.8 lbs. 61779 10 oz. Tube .8 lbs.